Our offer has ended but you can still stack up on these hand made African print clutches perfect for fall the beauty is there versatility. They go just about anywhere and with just about anything from the office to a girl’s Sunday brunch; with a suit or with jeans! They’re perfect as gifts or wardrobe additions! Tenneh is not only talented she aims to use her skill to help those in her native Liberia. It’s was Birthday and NY fashion week so I asked my friends to share the love! 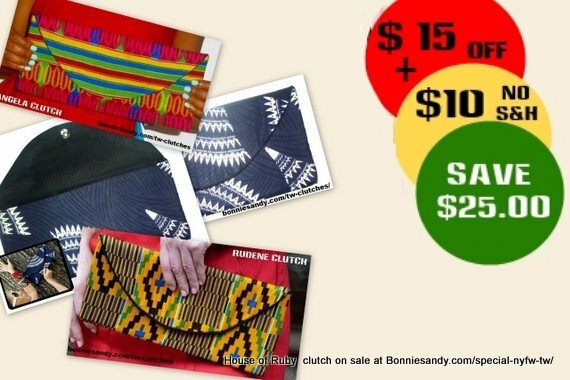 At $20 you saved $25 ($15 Plus free shipping) when you ordered any of these African Print Clutch bags from Designer Tenneh Wilkins of House of Ruby before 12 midnight on Friday 13th September 2013. Posted in Uncategorized and tagged Creative Specials, Tenneh Wilkins.